The EAA, officially opened in April 23th 2014, was created with the intent to provide a more "Professional And Expert" training for future pilots. In fact, the EAA has among its employees Exclusively Pilots of great and proven experience. 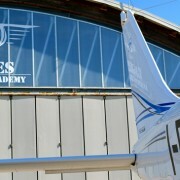 The EAA is structured, unique in Italy, as a real Air Force Academy: Students wear uniforms and degrees in accordance to level and Licenses achieved.